Where better in the world than the West of Ireland to enjoy a fishing Holiday! The famous Lough Corrib, abundant with Salmon and wild brown trout, and just 15 minutes up the road, Lough Mask, another spectacular wild brown Trout Lake. There are also many exceptional rivers in the area, the Clare and Robe rivers offer some excellent Salmon or evening Dry Fly fishing. Larry and his team are top quality Guides, many of whom have fished for their country. These Gillies or Guides know every nook and cranny of Corrib, Mask and Carra and will work hard all day to make sure you get the opportunity to catch your fair share of lively wild brown trout. March is the start of the duck-fly. The chironomid's (buzzers) signal the real start of our angling adventures. 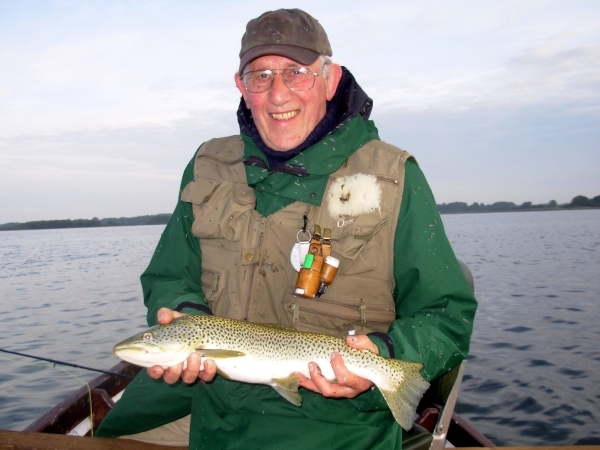 We can take you out on Corrib or Mask and you can experience the huge rises of trout throughout the lake. Whether you are a beginner or an experienced angler, our guides will ensure you get ample opportunities to catch these fish. These are probably the two most popular months on the fishing calendar. April signals the start of the olive fishing. These sturdy little flies are a pleasure to fish whether wet in small sizes or dry on top of the water to many free rising fish. May and the lake is alive. Now the dapping rods come out, 8 to 10 fish per rod per day is not uncommon. There is nothing as relaxing as chasing a large wild trout with a small dry mayfly. Many people think that these two months are most difficult, how wrong can they be? The fisherman's curse or (caenis) appears every morning at day-break and for those of you who want to experience something very special, this is the time to come. We fish from 4:30am approx. for fish, which can average 4lbs in weight, take a break during the day and fish our dry sedges late into the night. This type of fishing is difficult, needs patience but is hugely rewarding. In August we spend our time sedge fishing, usually with dry fly. During this month the daphnia appear and a lot of trout move to deeper water to feed on this plankton-like organism. Pulling wet flies through these large scholes of fish can be most exciting where two or three fish on at the same time is not unusual.